With our two boys, I have more photos of sports - both organized and outdoor/around-the-house "sports" play - than I know what to do with! A few months ago, I saw We R Memory Keeper's new release, MVP, previewed online. I LOVED it! I was really happy to find that Michael's carried the whole line in a paper slab last month. I used a 40% off coupon and started pulling out pictures to work with the line. Earlier this month, Emma over at Personal Scrapper posted a challenge to use a day of the week in your title on a page. I pulled out a collage of Kevin playing ball earlier this season and scrapped that Mondays and Thursdays are game day. I added Making Memories tiny type alphas to the WRMK kit. The "game" word was hand cut from another sheet of paper. The chipboard letters came with the kit. I also pulled out some older pics (I have boxes full of unscrapped photos!). This LO for Kevin is about our '06 trip to a Bats minor league baseball game. It's a lift from an idea on the back of the slab. Here's the LO for Blake's album from the same event. 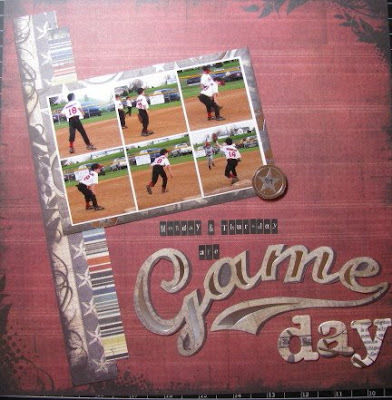 For National Scrapbook Day (yes, there is such a thing!) earlier this month, there was a blog crop at Paper Trunk. They had a sketch posted that I used for this page of Kevin from '06. I think he was Blake's baseball team's biggest fan that year! This page made for a quick LO of Blake with his basketball trophy for the '07 season. Finally, I documented a big day for Kevin. This was the day in '06 when Kevin proudly took his birth certificate to sign up for teeball. His wait was over and he was finally old enough to play! I still have a lot of this line to use and stacks and stacks of photos that I can pair up with it. It was really fun working with some older pics. I just can't get over how quickly our boys have grown! Great layouts Amy....you are really scrapping up a storm! Great sports layouts Amy! That paper line looks pretty cool! Those are GREAT LO's Amy!! The last one is so sweet! I can't wait till J is old enough to play sports. I think he will love soccer or basketball because he LOVES to run! !